Driving to the trailhead is, most of the time, a relatively straightforward thing. The parking areas are usually well marked or easily definable (like a wide roadway shoulder). Such is not the case with Red Rock Canyon Park. 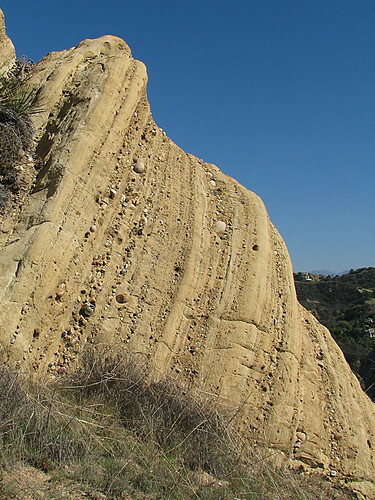 Located off Old Topanga Road, the turn-off on Red Rock Road has no sign indicating the park at its end. Driving down the road, one passes by numerous “no trespassing” and “no parking” signs. The road turns into a single lane. The asphalt ends and the road becomes gravel. It’s not hard to wonder after a half-mile if you’re really on the right road or headed into the middle of nowhere. Then, boom, there you are. I’ve passed by Red Rock Canyon Park numerous times over the years without knowing it. Heck, I’ve looked down on the park on previous hikes along the Calabasas Peak Motorway. Last weekend I found an old newspaper clipping at home and figured I’d check it out. The hike here is relatively short, but the geology is quite amazing. The best display of the namesake red rock is near the park entrance. From the parking area (picnic tables, restrooms and water available), head up the wide fire road, which starts under the shade of chaparral and sycamore trees. 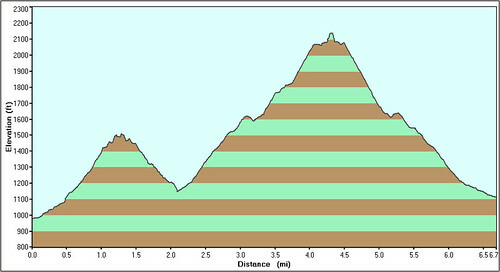 Be sure to examine the large outcropping that appears on the left about .3 mile in. 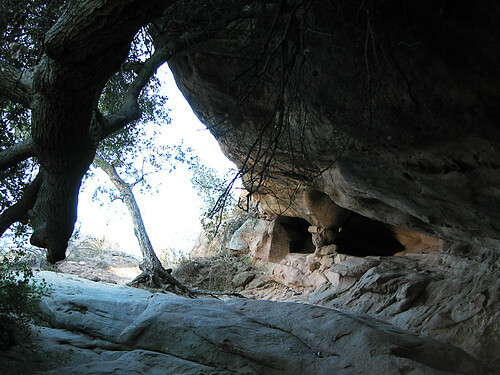 There, you’ll find numerous weathered caves carved by wind and water. 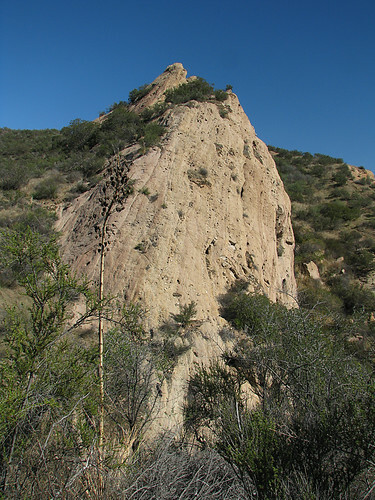 At about .4 mile from the trailhead, an optional spur trail (marked on the park map as the Red Rock Trail) crosses the creek and heads uphill to a ridgeline, then continues to climb through low chaparral and rocky outcrops. The geology here is amazing, with huge slabs of what was once flat river or seabed solidified, raised above sea level, and turned 90 degrees. The trail reaches the park boundary about .8 mile from the turn-off. A use trail appears to continue beyond, but becomes brushy. After picking off two ticks already, I decided to pass on going through thick brush on a trail that didn’t exist on my topo. Returning to the main fire road, turn right and continue climbing. 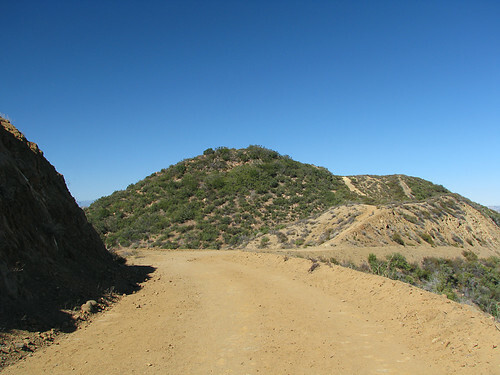 The trail gains altitude and views north towards the San Fernando Valley. 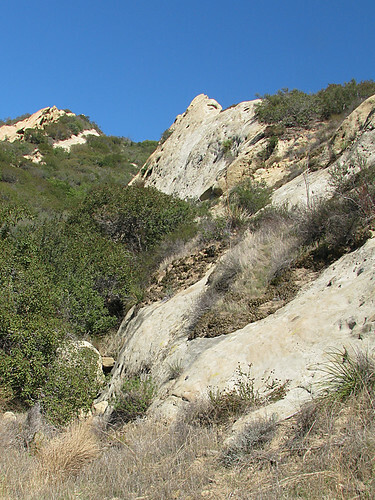 At 1.2 miles from the trailhead parking area, the trail reaches a T-junction with Calabasas Peak Motorway. A small bench will allow you to stop, rest, and take in the view. Looking south, the view takes in Stunt Road and the Stunt High Ranch (where you can hike the Stunt High Trail), with a small sliver of Santa Monica Bay visible on the other side of the ridge. Turning left from the junction will take you down .7 mile to Stunt Road (an alternative starting point for Calabasas Peak). 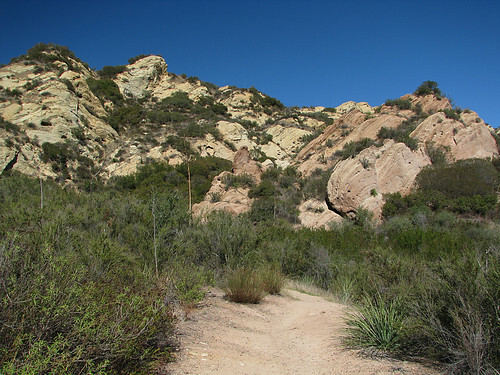 Our trail turns right on the fire road, crossing though a large white sandstone outcropping and climbing 1.2 miles from the junction to Calabasas Peak. 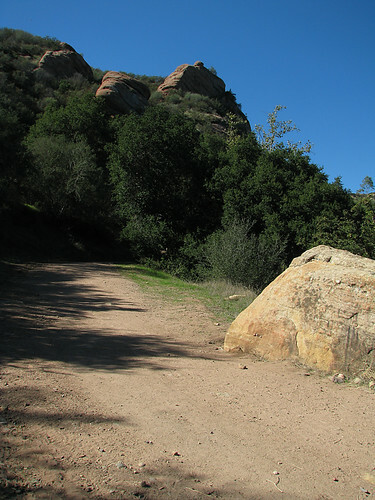 After a couple of turns, the trail passes a high point and the rounded top of Calabasas Peak comes into view. Directions: From U.S. 101 in the San Fernando Valley, exit at Topanga Canyon Blvd south. Drive 1.3 miles south to Mulholland Dr. and turn right. Drive .5 miles to Mulholland Highway and turn left. 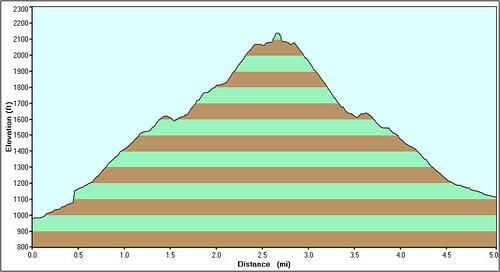 After 1.7 miles, turn left onto Old Topanga Canyon Rd and drive about 3.5 miles to Red Rock Rd. Turn right and drive .7 miles to the park entrance. Note: the last .4 miles are dirt road and impassable during inclement weather. Nice! Haven’t been down to do that yet. 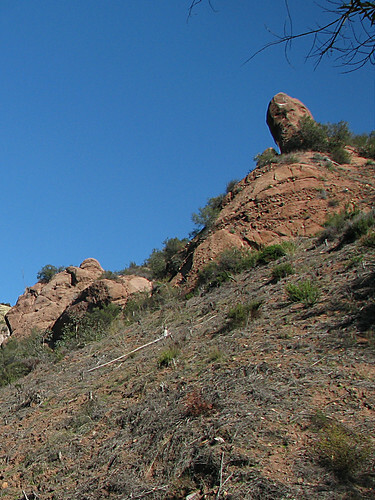 Also there are a few red rock trails one is in the Los Padres near Santa Barbara. Sigh. I’m jealous. More sighing. I’m with missmccracken & Homer-Dog. Jealously sighing and missing. 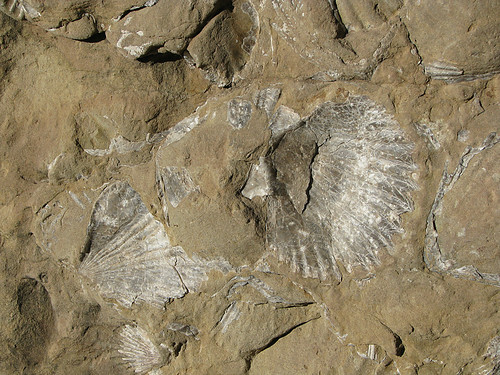 the fossils are so nice. and i love the photo with the cave. did you go inside? i’d be wary of someone or something living in it – lol. Cool shots – I dig the fossil. MissMcCracken – heh, when I hit the ridgline after the climb, it was sweating, panting, and more sweating! AbsurdBeats – Don’t they have rocks back there? Mel Heth – You should go see the whole rock, there were shells all over it! Beautiful pica of an area of have never been. Road trip soon! Thank you for posting.